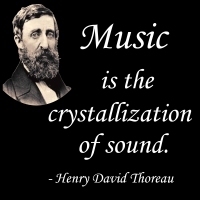 Famous American writer, philosopher and naturalist Henry David Thoreau (1817-1862) first stated this astute musical – natural metaphor. Now you can own this delightful quote (or give it away to your favorite music maker or Thoreau fan) on many marvelous merchandise options, as seen below! Buy it now on a t-shirt, hoodie, mug, tote bag or other quality gift or apparel item. Choose something for your favorite musician or literary aficionado, exclusively from GearGems!